Dog owners got approval to walk their leashed dogs in three North Hempstead parks after the Town Board, led by Supervisor Judi Bosworth, unanimously approved making a pilot program begun in July 2015 permanent. The three parks where people can now walk their dogs on-leash are Michael J. Tully Park in New Hyde Park, Mary Jane Davies Green in Manhasset, and the trail at North Hempstead Beach Park in Roslyn (See park names below for Google maps to their location.) The decision came on Tues., Feb. 23rd after a public hearing in which Parks Commissioner Jill Weber presented results from the Town’s survey on the pilot program and the Parks Dept’s own assessment of the success of the program. “The majority of comments received were very enthusiastic,” said Supervisor Bosworth, and the majority of people who spoke at the public hearing, including LI-DOG and its supporters, were in favor of the resolution. Among the key findings of the survey, which got about 150 responses, were that 94% of the responders had had no difficulties with the on-leash program. Seventy-four percent of respondents were familiar with the program and 60% had brought their leashed dogs to one of the town’s parks, according to Weber. Moreover, 95.5% of those surveyed said they would like to see the program expanded to more town parks. Weber noted that the Parks Dept. saw no increase in dog waste in any of its parks during the pilot program and that everyone she observed at Michael J. Tully Park, where the Parks Dept. has its headquarters, had been on-leash. She noted that many people had commented they felt safer walking in parks with their dogs, that the presence of dogs will deter geese and their droppings, and that many people want to be able to exercise more with their dogs. LI-DOG Vice President Peggy Heijmen applauded the town’s historic decision and agreed with those comments. Designating trails for dog owners in town parks will incent more people to get out and walk with their dogs, an activity public officials should encourage at every turn, she said. Until the launch of the pilot program, North Hempstead, like almost all other towns on Long Island, banned dogs in town parks. “As dog owners and dog lovers, we applaud the Supervisor, Parks Commissioner and Town Board for undertaking this refreshing initiative, which will enrich the lives of your residents and their dogs for years to come,” said Heijmen. The Town has indicated it will consider expanding the program to other parks in the future. “People love this program,” said Supervisor Bosworth. LI-DOG reminds its supporters to keep dogs on-leash in these new dog-friendly parks and to continue to spread the word about the importance of cleaning up after your dogs—always. 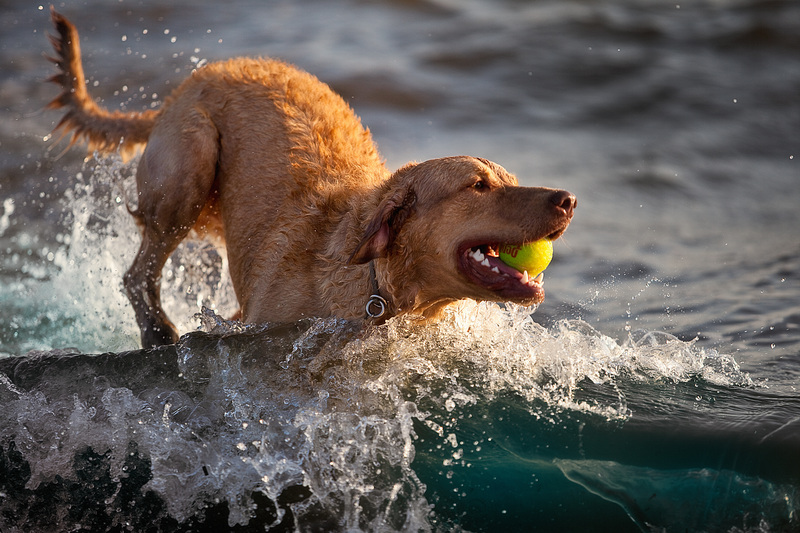 “The issue of unleashed dogs on our beaches is being reviewed by our staff in a very serious manner,” writes New York State Parks Long Island Regional Director Wayne Horsley in a June 2nd letter to LI-DOG. The letter comes in response to a lengthy communication from LI-DOG addressing concerns about dogs on beaches. The letter from NYS Parks comes after LI-DOG started a campaign in June 2014 to gain access to New York State beaches. Long Island is surrounded by miles of coastline, but other than on the East End, almost none of that coastline is accessible to dog owners and their dogs. Lack of access to beaches by dog owners is one of the most frequent complaints we hear about Long Island, especially from people who have moved here from other places around the country. In September, LI-DOG asked supporters to send the Office of Parks emails and letters making the case for more access to beaches. Thank you to our supporters for your thoughtful and articulate emails and letters! NYS Deputy Regional Director George Gorman responded by laying out the concerns the Office of Parks has about dogs on beaches. In April after interviewing community leaders on the East End and gathering new data and research, LI-DOG responded to the concerns point-by-point. (Read the full letter at Letter to NYS Parks Addressing Concerns About Dogs on Beaches.) LI-DOG also renewed its plea to the Office of Parks to work with LI-DOG to update its policies so they meet the needs of this large and growing constituency—Long Island families who own dogs. In response to the concern that endangered birds could be negatively impacted, LI-DOG noted it is asking for access to beaches during the off-season when migratory and endangered birds are not present. The National Park Service provides access to Fire Island National Seashore during the off-season and even during the summer dog owners are allowed to walk their dogs on boardwalks and bayside beaches at Fire Island. The National Park Service and East End Towns, which have protocols for protecting migratory birds during the summer when dogs are allowed on beaches, provide good examples of government authorities that balance the needs of wildlife with the recreational needs of local residents who own dogs. In response to the concern that some people are frightened by dogs and the potential for dog bites, LI-DOG responded that any on-leash or off-leash access to beaches would be clearly marked so that people who did not want to come into contact with dogs could avoid those areas or visit the vast majority of beaches that do not allow dogs. LI-DOG also noted while all dog bite incidents are traumatic, the likelihood of such incidents occurring in a public park or beach is extremely small. A New York City study in 2006 found that less than 3% of such incidents took place in a public park. LI-DOG made the case that far from turning people off from parks or beaches, the presence of dog owners and their dogs would be viewed by many people as welcome additions to the landscape. Academic studies indicate the presence of dog owners and their dogs in public spaces increases social interaction. As anyone who has ever owned a dog and walked them in a park knows, they’re a great way to meet new friends and neighbors! LI-DOG said it understands providing dog owners with access to beaches on Long Island represents a change in long-standing New York Parks policy. But, much has changed since current policy, which prohibits all access to NYS beaches on Long Island by dog owners and their dogs, went into effect. Today, it is difficult to explain to people why they can’t take their dogs to beaches on Long Island when this is a normal, expected activity on beaches around the country. Current NYS policy is out-of-date and draconian by today’s standards, writes LI-DOG. It’s time for the Office of Parks to work with the dog owner community to update its policies so they do a better job of addressing the needs of this large and growing constituency—people who own dogs. Forty-nine percent of American households own at least one dog, according to The American Pet Products Association. LI-DOG appreciates the Regional Director’s serious consideration of this issue, which affects thousands of Long Island families and we look forward to continuing our discussion about increasing access to NYS parks and beaches with the Regional Director and the Office of Parks. If you would like to let the Regional Director know what you think about allowing dogs on Long Island beaches, go to Contact Us on the NYS Parks website or write NYS Office of Parks, 625 Belmont Ave., W. Babylon, NY 11704. Remember, always, be polite.